I am super excited to announce that I’ve just been named a Disney Junior Mom with Disney Junior Canada! What does this mean? This means you’ll be hearing a lot more about your favorite Disney Junior characters like Doc McStuffins, Mickey Mouse, the brand new Sofia the First and more! I’ll be sharing exciting news with you about upcoming shows, giveaways and other fun news. This is a very exciting opportunity and I look forward to sharing it with you! 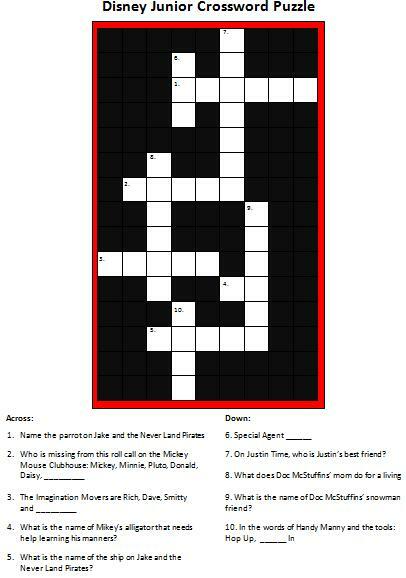 To celebrate, I’ve created this fun Disney Junior Crossword Puzzle for you and your little ones. Click here for the free printable. You’ll find all of the answers on the free printable game. You can also stay updated on the latest news by following Disney Junior Canada on Facebook & Twitter. See what the other Disney Junior Moms and I are up to by following the hashtag #DisneyJuniorMom on Twitter. Disney Junior Canada often has special movie premieres on their channel. What Disney movie would your little ones love to see on TV? My son’s favorite is Toy Story. We’ve watched all 3 movies multiple times and he still enjoys them. One of my favorites is Tangled – have you seen it? It’s really funny! Which Disney Junior Canada character would your child be most excited to meet? My son would pick Mickey Mouse because he loves the Hot Dog Dance. To stay updated on the latest fun ideas and all the scoop on Disney Junior Canada, you can follow Moms & Munchkins on Facebook and Twitter. We also have many more free printable games (including more for Disney) over on our Free Printable Games page. Oh wow! Congrats. That’s an exciting program to be part of. Looking forward to following along. Congratulations! My kids love Disney. i can’t wait to see all the cute and creative ideas that you come up with. Congratulations! My kids love Disney. I can’t wait to see what cute and creative ideas you come up with. Wow that is really exciting! I must confess I am 54 and I still love Disney!! So many great memories! !